The coin belongs to the Personalities series. 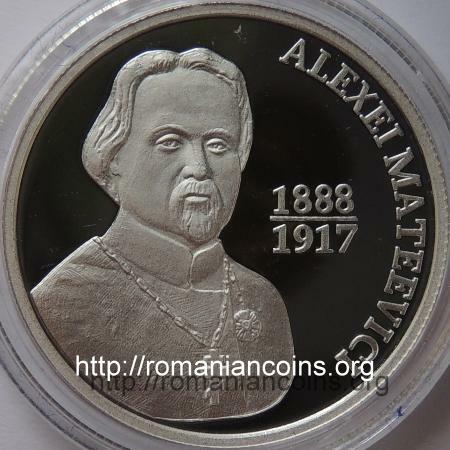 The Republic of Moldova issued another coin for the poet: 50 lei 2017 - Alexei Mateevici - 100 Years since Death (in Alley of the Classics from the public garden "Stephen the Great and the Holy" in Chişinău series). 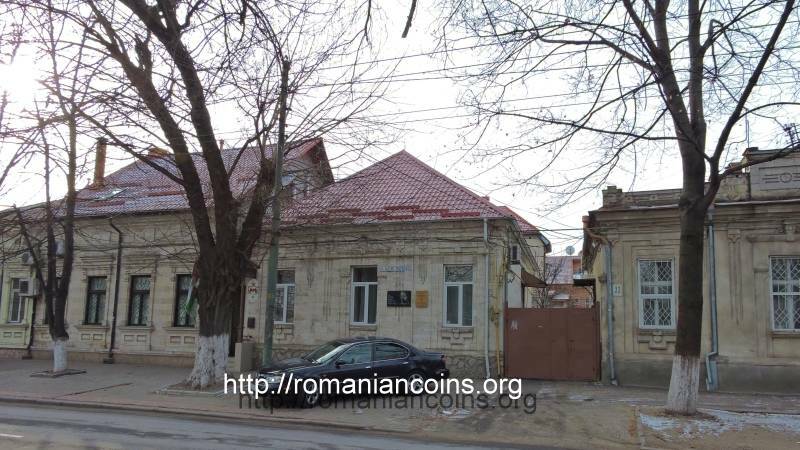 Alexei was born on March 16th (old style) 1888 in the village of Căinari. His father was a priest and his mother was a priest's daughter. He followed the primary school at Zaim (near Căuşeni) and then the religious school and the seminary at Chişinău. 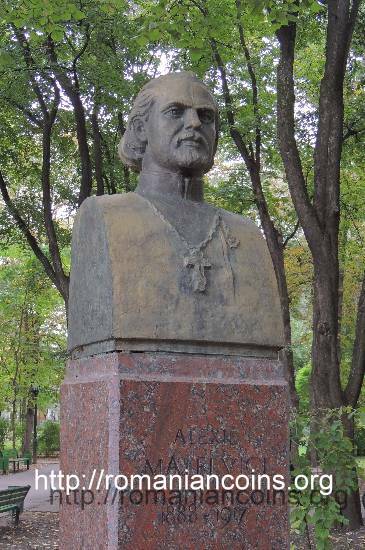 Between 1910 and 1914 he attended the Kievan Theological Academy (an institution initially founded in the 17th century as Collegium Kijovense Mohileanum). In 1914 he became a priest and in 1915 he left for the Galician front as military priest. In 1916 he arrived on the Romanian front, at Mărăşeşti, where he fell ill of typhus. Alexei Mateevici died at Chişinău on August 13th 1917. Mateevici debuted journalistically as well as literarily (with the original sketch Toamna [Autumn] and translations from Chekhov) in 1906, publishing his works in the newspaper Basarabia under the signature Alecu Mateescu but also under other (also Romanian) pen names: A. Mihăilescu, A. Lamprion, Fl. Măgureanu, Cîntăreţul basarabean [Basarabian singer]. In 1907 the same newspaper published several poems of his. In 1910 he started a collaboration with newspaper Luminătorul [Enlightener], church publication printed at Chişinău in Romanian but with Cyrillic characters. In 1917 Alexei Mateevici wrote the poem Limba noastră [Our Language], a real masterpiece and the most prominent anthem dedicated to the Romanian language. The author read this poem during the opening of classes for primary school Moldavian teachers, on the 17th of June 1917, at Chişinău. Although initially that was a festive poem, connected to the national re-awakening of the Basarabian Romanians in 1917 (Limba noastră-i foc ce arde / Într-un neam, ce fără veste / S-a trezit din somn de moarte / Ca viteazul din poveste. [Our language is a burning fire / To a people who, with no warning / Woke up from deathly sleep / Like the hero from the fairy tale. ]), the poem fascinated all generations since 1917 on. Poem Limba noastră has been, for the last tens of years of communism, a concealed bridge between the Romanians on the two banks of River Prut, those in Romania on one hand and those in the Moldavian Soviet Socialist Republic on the other. Poem Limba noastră, thanks to its simplicity and its special musicality, has been included in the studying material for elementary schools in Romania, even if that was without any mention to the fact that poet Mateevici was a Basarabian and with exclusion (censoring) of the quatrains that called forth, either directly or indirectly, the province of Basarabia (Eastern Moldavia, occupied by URSS) or religion, both tabu subjects for public debate during the Romanian communism. On the other bank of River Prut, Mateevici was considered, inside sovietized Moldavia, a local "national" poet, and as such free for publishing in a Russianizing, oppresive regime, which imposed as state dogma the thesis of a fundamental and opposable difference: Romanian-Moldavian, as ethnicity, and similarly in which the language spoken on the two banks of River Prut was concerned: a Romanian and a Moldavian language. 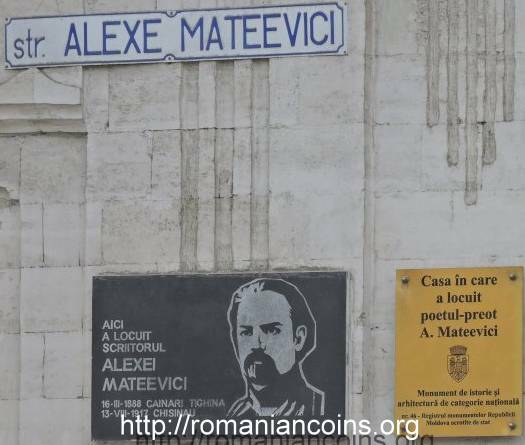 A puzzling reality is that the youngsters in Romania who were learning this poem in school did not know anything about the local descent of Mateevici, or the existence of another Romanian inhabited state inside USSR, or the thesis according to which the author of Limba noastră would have written in a language different from theirs. 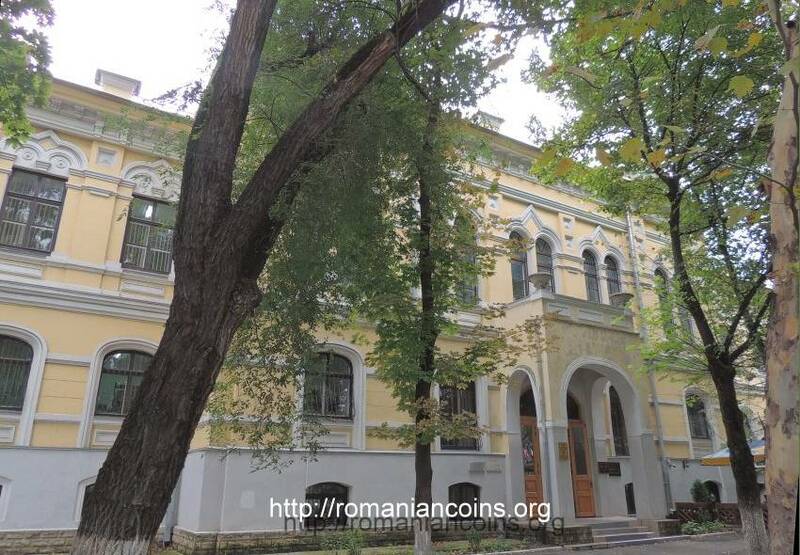 Today poem Limba noastră is the national anthem of the Republic of Moldova. 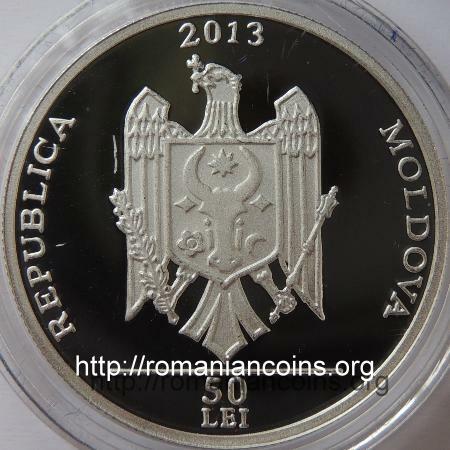 The anthem comprises only 5 out of the 12 quatrains of the poem, having replaced in 1994 anthem Deşteaptă-te, române [Wake Up, Romanian] (between 1991 and 1994 Romania and the Republic of Moldova had the same anthem). Another very known poem of Mateevici is Pietre vechi [Old stones], written at Mărăşeşti in 1917 (În Bugeac, la Căuşeni / Dorm strămoşii moldoveni, / Numai pietre de mormînt / Mai păstrează-al lor cuvînt. [In Bugeac, at Căuşeni / Moldavian forefathers sleep / Only tombstones / Still keep their word.]). Mateevici translated from Russian several short novels and poems. He also wrote articles and studies about folklore. Above all, he stands out as the author of Limba noastră. 1. Mateevici Alexei, Limba noastră and Other writings. Porţile Orientului Printing House, Iaşi, 2008, preface by Ion Nuţă.